Update May 26: The Charleston City Paper﻿ also has coverage, most notable for the inclusion of a video that also features Alvin Ailey American Dance Theater's Kanji Segawa's dance to "Takademe" by Robert Battle; take a gander over here and scroll down for our coverage and photos. Keep up with the festival on our Spoleto topic page. Update May 25, 1:40 p.m.: There was a strong showing for the opening ceremony this afternoon which featured speeches from Carlos E. Evans (Chairman of the Spoleto Festival Board), Daniele Benedetti (Mayor, Spoleto, Italy), Rocco Landesman (Chairman of the National Endowment for the Arts) and Mayor Joseph P. Riley, Jr. 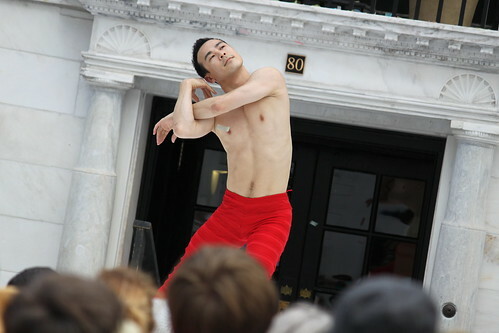 The crowd was also treated to "Fanfare for the Common Man" courtesy of the Charleston Symphony Orchestra's Brass Ensemble, the national anthem by Spoleto performer Gregory Schmidt and a performance by dancer Kanji Segawa to Robert Battle's "Takademe." 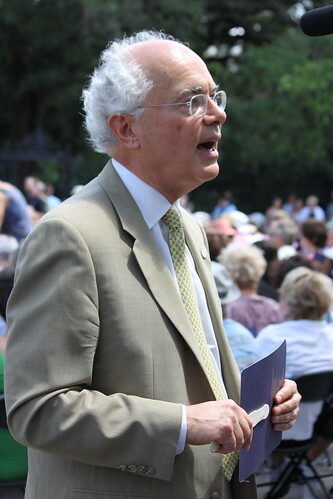 General Director of Spoleto Festival USA, Nigel Redden, giving interviews. From left to right: Dr. Theodore S. Stern, Spoleto Chairman Emeritus; Dr. Sarah Lynn Hayes, Chairman of the South Carolina Arts Commission; Rocco Landesman, Chairman of the National Endowment for the Arts; Carlos E. Evans, Spoleto Festival Chairman of the Board; Mayor Joseph P. Riley, Jr; Daniele Benedetti, Mayor of Spoleto, Italy; Homer C. Burros, Spoleto Festival Chairman Emeritus. 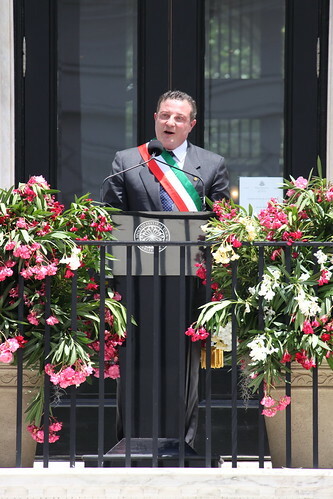 Mayor of Spoleto, Italy, Daniele Benedetti. 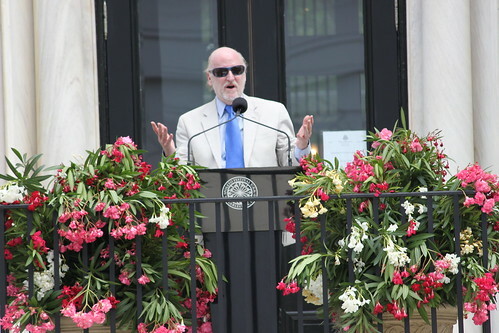 National Endowment for the Arts Chairman, Rocco Landesman, confessing his love for the Holy City. 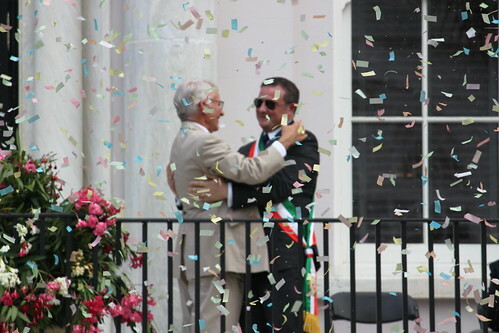 Mayor Riley and Mayor Benedetti share an embrace at the end of the ceremony. Alvin Ailey American Dance Theater's Kanji Segawa closes the festival with a dance to "Takademe" by Robert Battle. 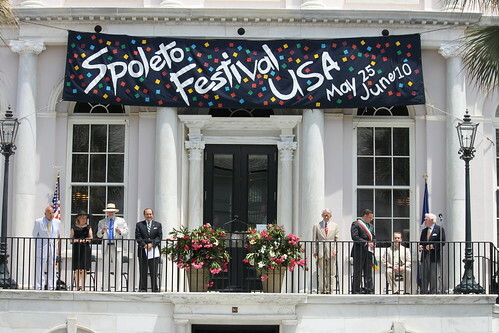 Update May 25: Spoleto Festival 2012 officially kicks off today with the grand opening ceremony at noon. Per usual, the opening ceremonies, which take place at 80 Broad Street in downtown Charleston, will include speeches, ringing church bells, brass fanfare and confetti. Spoleto Festival USA, which showcases nationally and internationally acclaimed artists in a distinctive program of opera, theater, dance, physical theater, music, and visual arts. The 36th annual Festival, held in historic Charleston, South Carolina, from May 25 through June 10, focuses its attention this season on the work of contemporary artists and crosses conventional genre boundaries with a schedule of innovative performances by trail-blazing artists. A sense of physicality permeates the 2012 Festival program, from energetic, body-centric dance in Cedar Lake's Violet Kid, to intense, high-risk acrobatics in Traces. Through the creative use of technology, the human body undergoes strange and wondrous transformations in Zoe | Juniper's A Crack in Everything, moves effortlessly through an animated dystopia in The Animals and Children Took to the Streets, and even defies gravity in Leo. Movement becomes a storytelling medium in Kyle Abraham's The Radio Show, while other more traditional narratives prevail in humorous but thought-provoking monologues by Jack Hitt and Mike Daisey. On the music front, the offerings include notable performances by musicians whose work resists categorization, such as iconic vocalist k.d lang, modern American string band Joy Kills Sorrow, ukulele virtuoso Jake Shimabukuro, and New Orleans' Rebirth Brass Band. Contemporary composers also take the spotlight with premieres of major works by Philip Glass, Guo Wenjing, and John Cage, and concerts featuring new pieces by Japanese composers Somei Satoh, Toshio Hosokawa, and Toshi Ichiyanagi; British composer Tansy Davies; and Radiohead's Jonny Greenwood. Tickets to these and a wide variety of other Festival performances are available Monday, January 2, at spoletousa.org and (843) 579-3100. The 2012 opera program offers two significant American premieres. To date, Kepler, the newest opera by minimalist pioneer Philip Glass, has only been presented in concert form. To commemorate the composer's 75th birthday and acknowledge his long-standing collaborative relationship with Spoleto, the 2012 Festival will feature the first fully-staged production of Kepler in the U.S. Directed by Sam Helfrich, who directed Glass' Orphee at Glimmerglass Opera in 2007 to critical acclaim, and with John Kennedy conducting the Spoleto Festival USA Orchestra, this celestial-themed opera explores the mind and soul of visionary astronomer Johannes Kepler. Written by Guo Wenjing, one of China's most important contemporary composers, Feng Yi Teng depicts a fateful meeting destined to change the course of Chinese history. Beijing opera tenor Qian Qihu and Sichuan opera soprano Shen Tienmei-both prominent voices in Chinese opera-lead a star-studded artistic team that includes Tony Award-winning set designer Derek McLane (Bengal Tiger at the Baghdad Zoo, 33 Variations), costume designer Han Feng (Madama Butterfly for Metropolitan Opera, The Bonesetter's Daughter for San Francisco Opera), and internationally acclaimed film director Atom Egoyan (The Sweet Hereafter, Chloe). Ken Lam conducts an orchestra of eleven Western and four traditional Chinese instruments. Feng Yi Teng is a co-production between Spoleto Festival USA, Currents-Art & Music, and Lincoln Center Festival. The 2012 theater lineup features the return of two popular international theater companies. Dublin's Gate Theatre is an undisputed Spoleto favorite making their eighth Festival appearance with a production of Noël Coward's urbane comedy of manners Hay Fever directed by Patrick Mason. Britain's innovative theater collaborative 1927, whose Between the Devil and the Deep Blue Sea played to sold-out crowds at the 2008 Festival, returns in 2012 with The Animals and Children Took to the Streets, a dark comic fairytale told through the seamless blend of live performance, music, and stylized animation. The theater offerings are rounded out with shows by two very different but equally compelling monologists. Peabody Award-winning journalist Jack Hitt, heard on public radio's This American Life, combines an affable anecdotal style with an interest in contemporary brain science in Making Up the Truth; and Mike Daisey, deemed "a master storyteller" by The New York Times, turns his razor sharp wit on the timely topics of technology and multinational business with The Agony and the Ecstasy of Steve Jobs and Teching in India. Innovative circus-based performance is fast becoming a Spoleto tradition; in 2012 physical theater presentations range from the sublime to the spectacular. Leo, performed with flawless precision by Circle of Eleven's Tobias Wegner, features one man's touching and funny exploration of a world suddenly turned sideways where the laws of gravity refuse to be obeyed. In sharp contrast, Traces is 90 minutes of heart-pounding, nonstop acrobatics, urban dance, and effortless athleticism performed by Montreal-based new circus troupe 7 Doigts (7 Fingers). The focus of the 2012 dance series is squarely on the contemporary dance scene. Under the leadership of new artistic director Robert Battle, Alvin Ailey American Dance Theater enlivens their rich repertoire of Ailey classics (Revelations) with fresh new works. Cedar Lake Contemporary Ballet, always a showcase for the world's most sought-after choreographers, returns to the Festival with pieces from celebrated French dance maker Angelin Preljocaj and Hofesh Schechter, one of the UK's most exciting young choreographers. These two powerhouse presentations are complemented by the provocative work of two innovative young companies: Seattle-based Zoe | Juniper, with their haunting multi-media piece A Crack in Everything; and the Abraham.In.Motion performance of company founder Kyle Abraham's reflection on community and memory, The Radio Show. Led by Director for Chamber Music Geoff Nuttall, the ever-popular Bank of America Chamber Music Series features thirty-three concerts of 11 programs performed twice daily in the historic Dock Street Theatre. Accomplished violinist and series newcomer Jennifer Frautschi joins a stellar roster of esteemed musicians returning to the Festival in 2012, including the St. Lawrence String Quartet, pianist Pedja Muzijevic, violist Hsin-Yun Huang, pianist Inon Barnatan, clarinetist Todd Palmer, and recent MacArthur Foundation prize winner, cellist Alisa Weilerstein. Specific repertoire and artists will be announced in late spring. Anne Manson, one of America's foremost female conductors, makes her Spoleto debut guest conducting the Spoleto Festival USA Orchestra in a concert of Tchaikovsky's Piano Concerto No. 1 and Stravinsky's Petrushka featuring longtime Festival chamber musician Stephen Prutsman on the piano. This concert marks the last public performance in the Gaillard before the auditorium closes for a major three-year renovation. The Festival's young orchestra will also perform a second concert under the direction of Resident Conductor John Kennedy in a program that celebrates contemporary musical achievement with the American premiere of John Cage's orchestral trilogy Twenty-Six, Twenty-Eight, and Twenty-Nine. Also on the program is Doghouse, by Radiohead guitarist Jonny Greenwood. Under the baton of Joseph Flummerfelt, Spoleto Festival USA Artistic Director for Choral Activities, the Westminster Choir joins forces with the Spoleto Festival USA Orchestra and the Charleston Symphony Orchestra Chorus for a program featuring Maurice Duruflé's exquisite Requiem and Verdi's emotional Stabat mater. Conducted by Joe Miller, Director of Choral Activities at Westminster Choir College, the choir will also offer their two traditional a capella concerts in the Cathedral Church of St. Luke and St. Paul, featuring repertoire ranging from Rachmaninoff to contemporary compositions, as well as a special concert of Herbert Howells' profoundly moving Requiem performed in the Cathedral of St. John the Baptist. Emphasizing the Festival's multi-disciplinary approach to artistic programming, musical offerings at the 2012 Festival feature established artists performing alongside emerging talents, all of whom push genre boundaries and embrace myriad styles. Four-time Grammy Award winner k.d. lang, who makes her Festival debut with the Siss Boom Bang band, is recognized for a sophisticated style forged from elements of country rock, punk, torch song, and jazz, with a touch of bossa nova. Boston-based string band Joy Kills Sorrow "merges bluegrass with jazz like it is the most natural combination in the world" says the Los Angeles Daily News. And one of the brightest young talents to emerge on the Creole music scene, four-time Grammy nominee Cedric Watson, brings his band Bijou Creole to the Festival Finale for an all-ages concert that combines old-school zydeco with strong blues-inflected vocals. A new highlight of the Festival Finale will be a Beer Garden featuring artisan beer and musical entertainment throughout the afternoon by local and regional bands. Resident Conductor John Kennedy's thought-provoking Music in Time series includes the always amazing Bowed Piano Ensemble in a program featuring composer Stephen Scott's classic for the instrument, Rainbows; a performance of Feng Yi Ting composer Guo Wenjing's percussion piece Dramas; and an intimate, piano-side conversation with contemporary music icon Philip Glass that celebrates his 75th birthday year and long history with Spoleto Festival USA. The Festival's late-afternoon Intermezzi concerts feature artists from the Spoleto Festival USA Orchestra and the season's operas in varied programs, including a performance of Arnold Schoenberg's groundbreaking and influential Pierrot Lunaire. The Wells Fargo Jazz Series has become a showcase for a range of diverse musical styles loosely gathered under the broadly inclusive jazz umbrella; the 2012 installment is no exception, featuring popular returning artists and exciting Festival newcomers. After her acclaimed Spoleto debut in 2001, Virgínia Rodrigues returns to the Gaillard stage lending her spellbinding contralto voice to songs steeped in African and Portuguese traditions; double-bass virtuoso Renaud Garcia-Fons' unconventional style virtually reinvented the way the instrument could be played, resulting in an altogether new sound that enchanted Festival audiences in 2005; and Jake Shimabukuro, whose one-night-only appearance drew a record crowd to the College of Charleston's Cistern Yard in 2009, brings his versatile ukulele and lightning-fast fingers back to Spoleto for two concerts at the Cistern Yard. Twenty-two-year-old Cécile McLorin Salvant, described as "a young jazz prodigy" by Paris Hot Club magazine, recently took home first prize in the Thelonious Monk International Vocal Jazz Competition. This talented French-American vocalist makes her Spoleto debut at the 2012 Festival, as does gospel legend Mavis Staples, a ground-breaking artist whose history-spanning career broke the barriers of gender and race, paving the way for future generations of musicians, like Ms. Salvant, to rise to prominence. At opposite ends of the Festival schedule-and of the musical spectrum-internationally acclaimed flamenco pianist David Peña Dorantes gracefully integrates classical, jazz, Celtic, and Brazilian themes in a concert during Spoleto's opening weekend; while Rebirth Brass Band evoke the streets of their native New Orleans with a signature jazz/funk/hip-hop sound that brings an upbeat party atmosphere to the final days of the 2012 Festival. Return to the Sea: Saltworks centers on a site-specific installation created solely from salt-a symbol of purity in Japanese culture-during Motoi Yamamoto's three-week residency at the Halsey Institute of Contemporary Art. Radiating an intense tranquility, the work is the artist's attempt to preserve the memories of his sister who died of brain cancer at 24. In partnership with the Festival, the installation will be exhibited at the Halsey, along with a series of Motoi's recent drawings, paintings, and sketchbooks.